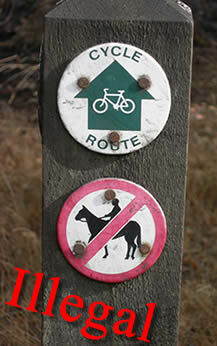 Equestrians are entitled to use these routes - legally. 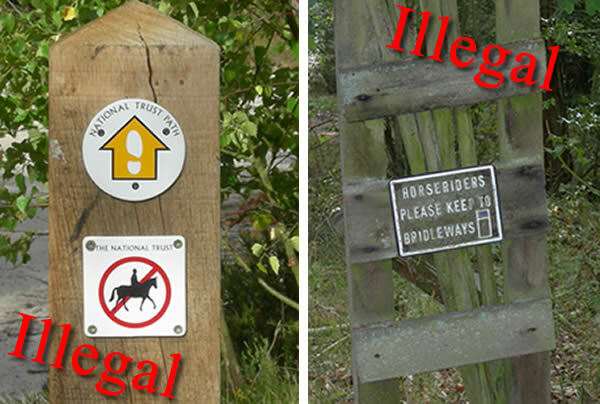 It's the National Trust and other local authorities that have erected the signs that are acting illegally. These three signs have just been photographed by Bob Milton on Frensham Common, Surrey. But there are thousands of other illegal signs all over the country banning equestrians. Why should equestrians be illegally banned from riding on bridleways, tracks and other routes when they are legally entitled to do so ? Says Bob Miltob, "It is not just new BW’s that count for equestrians but protecting the existing network, making sure all BWs and Byways are properly maintained and open and that all pre 1949 historic unclaimed BWs are claimed before the cut off date in 2025. We must also ensure that riders know their rights over equestrian access land such as s193 commons and those with Commons Act 1899 schemes in place." Do you know any other signs illegally banning equestrians ? Send us details and photographs. Do you suspect any signs banning equestrians are, in fact, illegal? If we don't fight for riders rights, we will lose what rights we have.